Jackfruit, poor people fruit or jak tree (Artocarpus heterophyllus) is a fast growing evergreen tree, native to the jungles of India. It ranges from 450 to 1,600 m. altitude. It is widely distributed in tropical and subtropical countries of Asia (India, Burma, Sri Lanka, southern China, Malaysia) and Africa (Kenya). Besides a fruit tree, it is a decorative tree that provides plenty of shade. 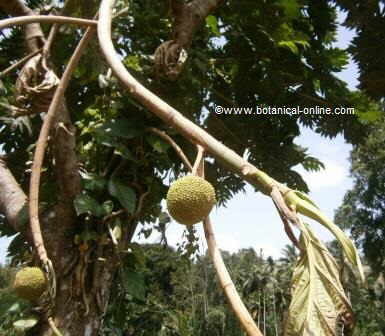 It belongs to the Moraceae family, being related to mulberry, breadfruit and fig treee. Noted for its dense and broad crown, with large leaves of 20 or more cm. long, dark green, glabrous, glossy, oblong, deeply lobed or leathery. Monoecious plant with male and grouped female flowers, growing from the same trunk or branches. Fruits are huge, up to 90cm. long, hanging from the branches and the trunk. (It is one of the world’s largest fruit). – Tropical or subtropical climates. – In tropical climates, it grows to great heights. – Freezing cold damages its leaves and branches, although, if the tree is protected during their first winter, it can develop. – Locate it in full sun and in a place protected from the wind. – Type of soil: sandy loam, deep, well drained. – It does not tolerate calcareous soils or water stagnant ones. – Fertile soils rich in organic matter, such as those found in tropical rainforests. – Need some degree of moisture and it is not drought resistant. Fresh seeds are sown in the first 4 days after being removed from the fruit. Before being sown, it is recommended to place them 12 days in a medium with phytohormones to favor germination. Germination may take place in three weeks. Plant in a deep seedbed. Transplant in deep pots when first true leaves appear . This tree should be protected from cold in the first winter if planted in tropical areas. Mulch especially in subtropical climates. Plant in the final place when 23 years old. Soil should be rich in organic matter, deep, well drained. Plant preferably out of the wind. jackfruit tree in a rainforest. 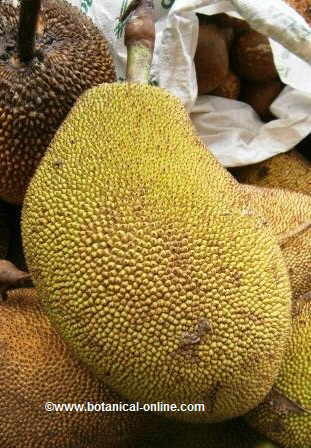 Jackfruit tree produces fruit from 46 years on. 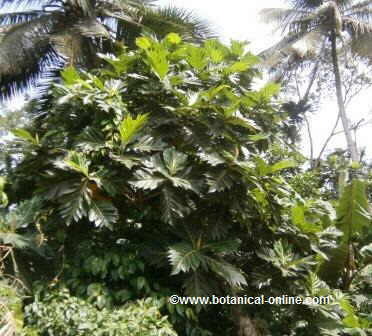 It is very productive, especially in tropical climates where a single tree can produce 100 fruits per year. Fruits are late maturing and harvested at 37 months after flowering. They are usually harvested immature and the ripe fruit is very perishable. Collect them with the protection of gloves to avoid contact with the sticky resin that coats the skin. Insects like caterpillars, mealybugs, etc..
Pests like stem and fruit borers.